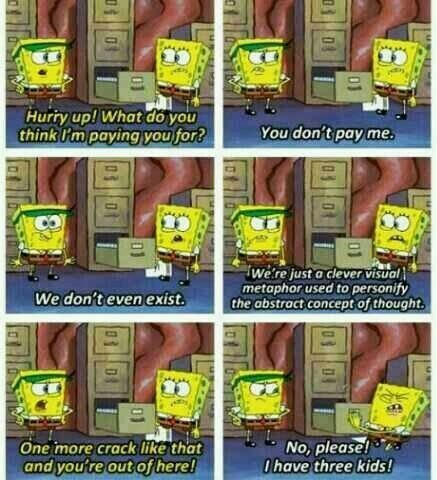 “Spongebob Squarepants” was and is arguably one of the best cartoons to ever air on Nickelodeon. Debuting in 1999, we have all grown up laughing at the stupid things the characters have said, yet we are addicted to the dumbfounding comedy. In 2016, I still binge watch Spongebob and I am not ashamed. I have labeled myself as a Spongebob enthusiast and I hear myself quoting Squidward at least once a day. 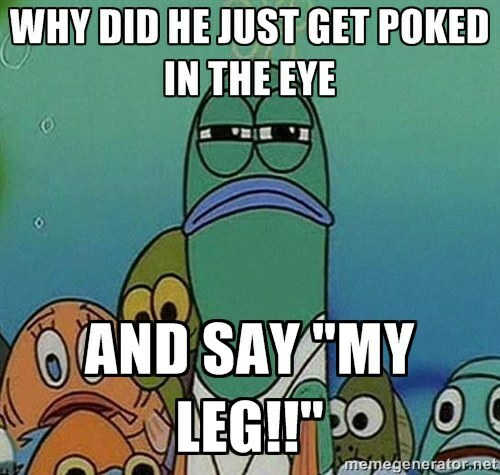 Here are 20 of some of the best quotes ever said by our friends from Bikini Bottom. 1. 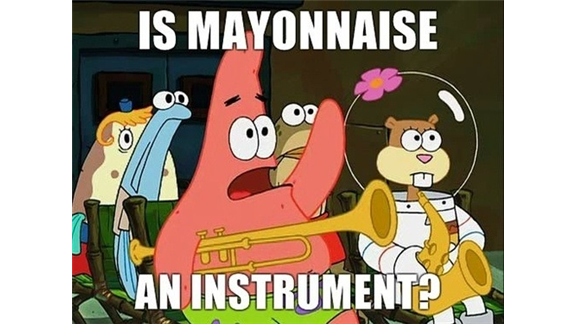 Patrick: Is mayonnaise an instrument? Squidward: No Patrick mayonnaise is not an instrument. *Patrick raises hand* Squidward: Horseradish is not an instrument either. 2. 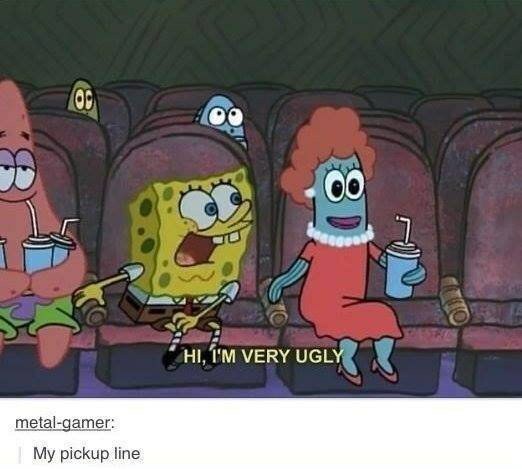 Spongebob: I'm ugly and I'm proud! Patrick: "No Spongebob, you just stink!" 3. *Phone Rings*- Is this the Krusty Krab? 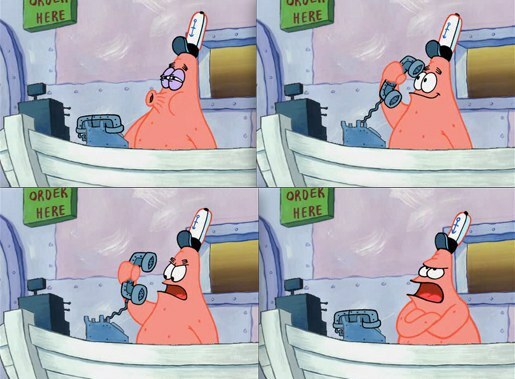 Patrick: No this is Patrick! Patrick attempting to take over Squidward's job as a cashier. 4. 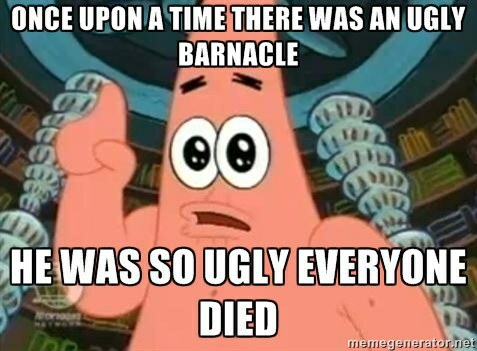 Patrick: Once there was an ugly barnacle, he was so ugly that everyone died. The End! Such an inspiring message Patrick. Spongebob felt so much better after that beautiful story. 5. 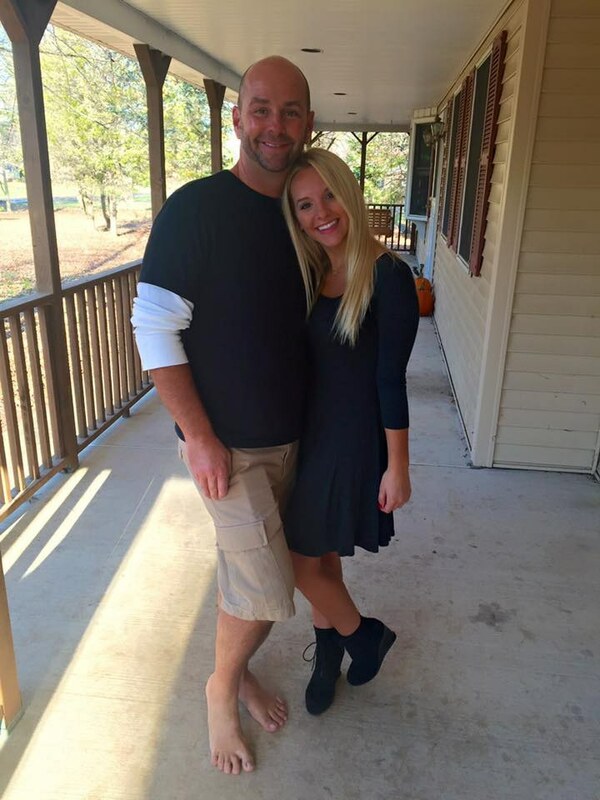 Random Man: My Leg! You usually hear this after a fire, a car wreck or any type of mass chaos going on in Bikini Bottom. 6. Spongebob: Oh a rock! 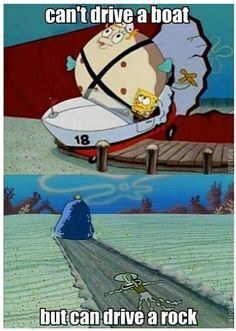 The pioneers used to ride these babies for miles! The pizza has to be cold by now. I mean after miles of walking and some type of sand tornado, you know there is no way that pizza is hot. 7. 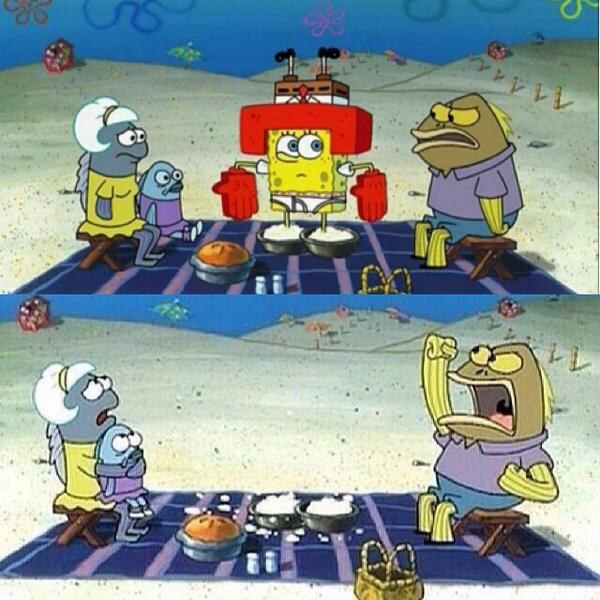 Secondary fish character: It took us three days to make that potato salad! Three days! We always see this fish but never know who he is. 8. 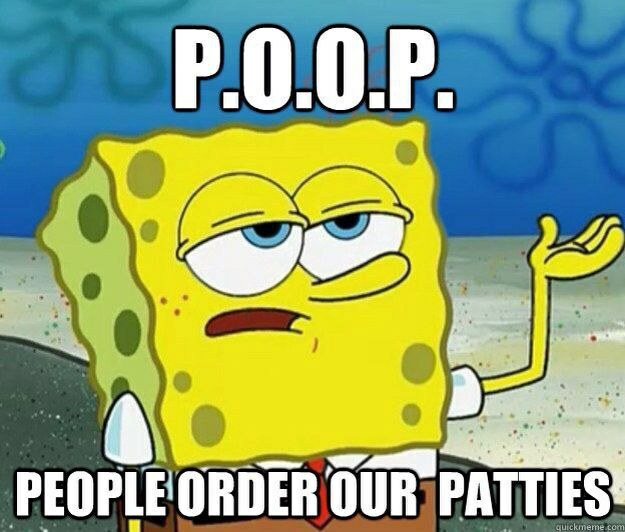 P.O.O.P.--People Order Our Patties. 9. Sandy: Don't you have to be stupid somewhere else? Patrick: Not until 4. 10. Spongebob: Squidward, I used your clarinet to unclog my toilet. 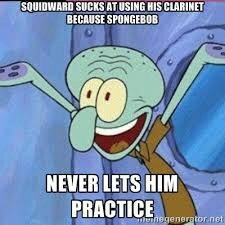 Squidward's most prized possession, the clarinet. 11. 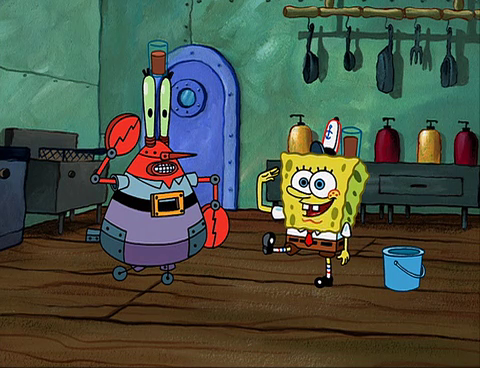 Spongebob and Mr. Krabs robot singing in unison: Meatball, meatball, spaghetti underneath. Ravioli, Ravioli, Great Barrier Reef! 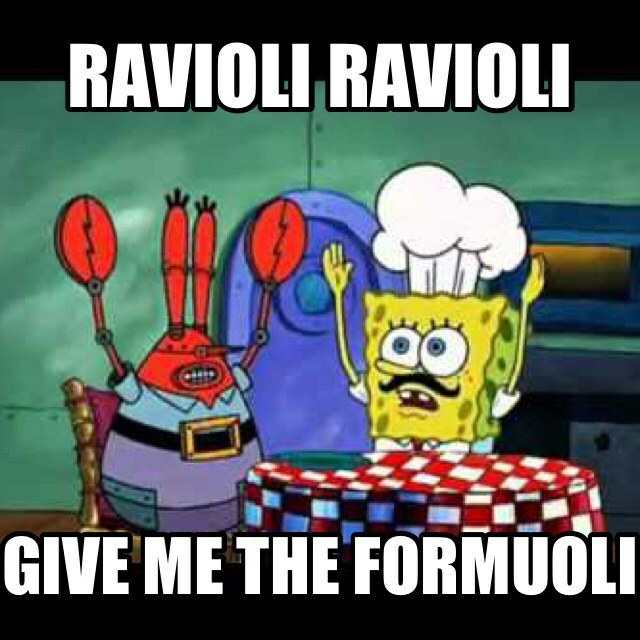 Ravioli, Ravioli give me the formuoli. 12. Patrick: Are you Squidward? (Talking to a fire hydrant) Patrick: No? That’s okay take your time. Tentacle Acres: A strictly squid community. 13. Patrick: East? I thought you said weest! Who let Patrick in charge of the compass anyway? 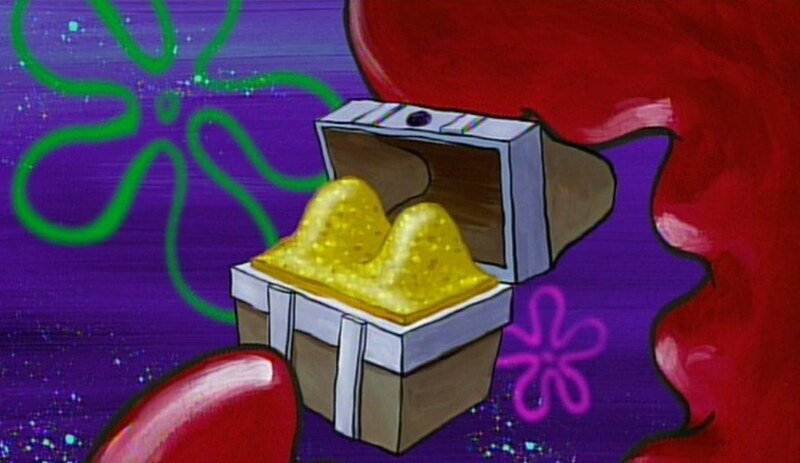 At least it led them to the Flying Dutchman's treasure--and Mr. Krabs got a plastic replica. 14. *Patrick trying to teach Squidward how to hold a jelly fishing net, but he is in a full body cast* Patrick: Firmly grasp it, firmly grasp it, firmly grasp it! 15. 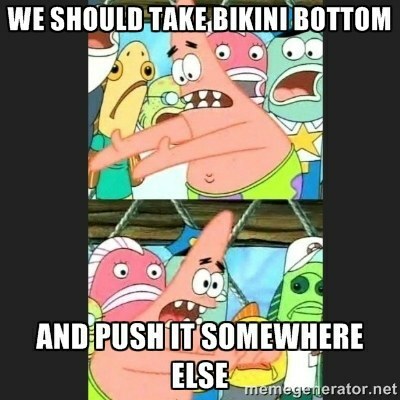 Patrick: We should take Bikini Bottom, and push it somewhere else! 16. 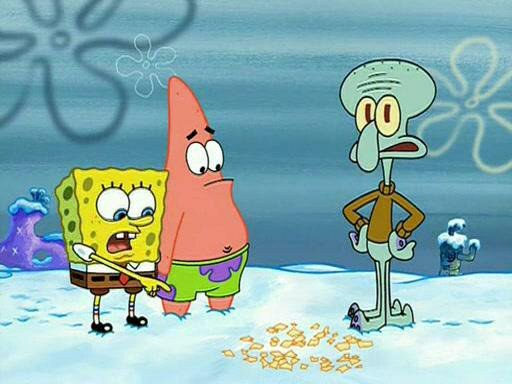 Spongebob: Squidward, that’s not a peace treaty, that’s a copy of the peace treaty. Spongebob is Squidward’s favorite neighbor! 17. Squilliam: What's your name son? Spongebob: Uh Beef Wellington. Squilliam: No your name. Spongebob: Uh fork on the left? The Krusty Krab is turned into a five-star restaurant as Squidward once again tries to be better than Squilliam Fancyson. 18. Real Estate Agent: He's Squidward, You're Squidward, I'm Squidward! Are there any other Squidward's I should know about? Gary: Meow. Real Estate Agent: I'm outta here! 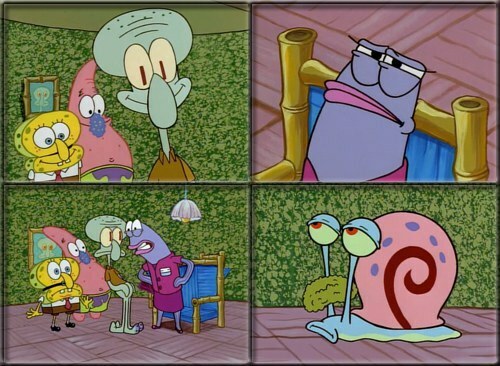 Even Gary was dressed up as Squidward. 19. 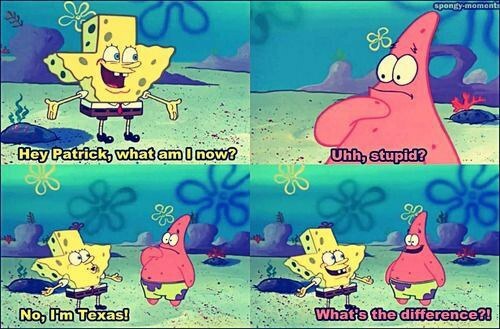 *Spongebob shaped as Texas* Spongebob: What am I now? 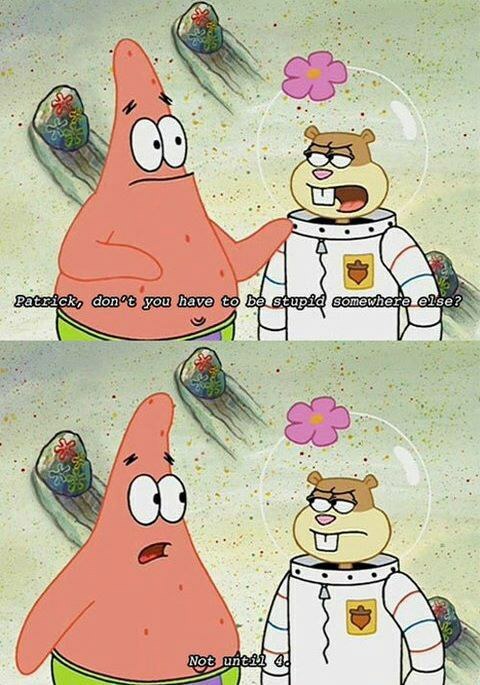 Patrick: Uh, Stupid? Spongebob: No! I'm Texas! Patrick: What’s the difference? 20. Spongebob: Hey Patrick, I thought of something funnier than 24. 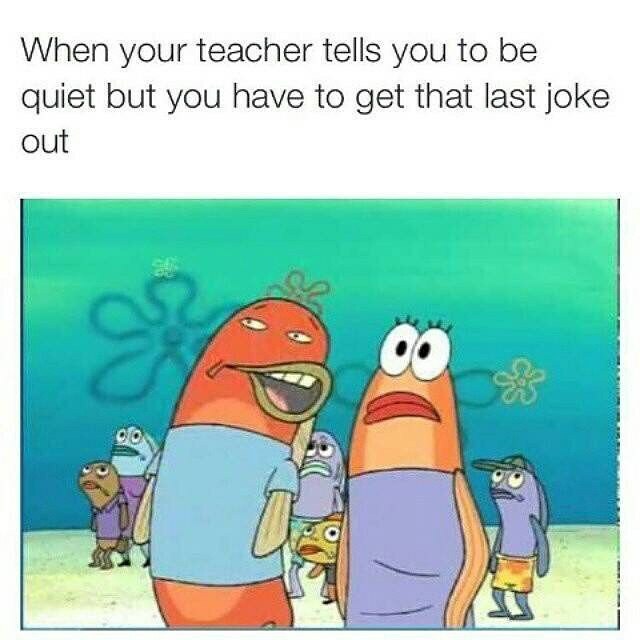 Patrick: Let me hear it. Spongebob: 25! These two can make anything hysterically funny... even the most basic words, numbers and phrases. Oh Bikini Bottom, we pledge our hearts to you! As faithful, as deep, as true, as blue! Bikini Bottom we love you!